GAHS senior Cory Call completes a fast break with a layup, during the Blue Devils’ 55-37 victory on Friday in Centenary, Ohio. Gallia Academy senior Brendan Carter (21) goes up for a layup, during the Blue Devils’ 55-37 victory on Friday in Centenary, Ohio. CENTENARY, Ohio — Every time the Trojans got close, the Blue Devils just pulled away again. 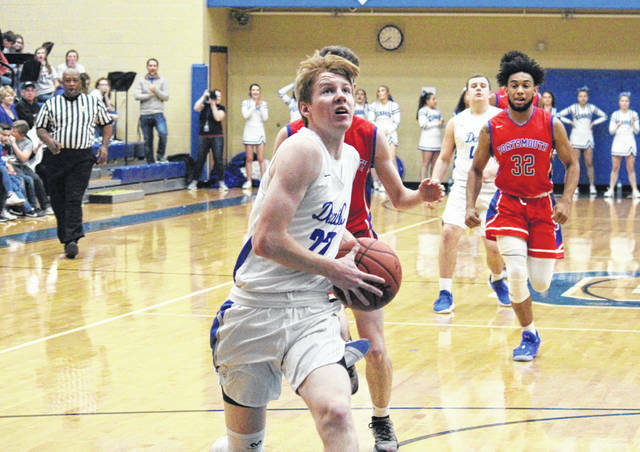 Ultimately, the Gallia Academy boys basketball team led wire-to-wire on its way to a 55-37 victory over Ohio Valley Conference guest Portsmouth on Friday in Gallia County, giving the Blue Devils the season sweep of the Trojans. Gallia Academy (11-8, 7-5 OVC) — which defeated PHS by a 62-44 count on Jan. 15 in Scioto County —scored the first nine points on Friday and led 12-5 by the end of the first quarter. The Trojans scored the first bucket of the second quarter, but the Blue Devils claimed the next 10 and led 22-7 with three minutes left in the first half. Portsmouth, however, closed the half with a 10-to-4 run, trimming the GAHS lead to 26-17 by the break. The Trojans were within six points after opening the second half with a three-pointer, but Gallia Academy scored 13 of the next 18 points and led 39-25 with eight minutes to play. Portsmouth started the fourth quarter with a 12-to-5 run, cutting the GAHS advantage to 44-37 with 2:50 remaining. The guests didn’t score again, as the Blue Devils scored 11 unanswered points to seal the 55-37 victory. Following the win, GAHS head coach Gary Harrison talked about his team’s strong defense, but admitted there’s still work to do before the Blue Devils are ready for the postseason. “I feel like we’ve played great defense all year,” Harrison said. “Even against Fairland the other night, it was 37-31, we held Fairland to 37 points. Coach (Jared) McClelland has the defense and does a great job with that. Portsmouth’s good, and they’re getting better. 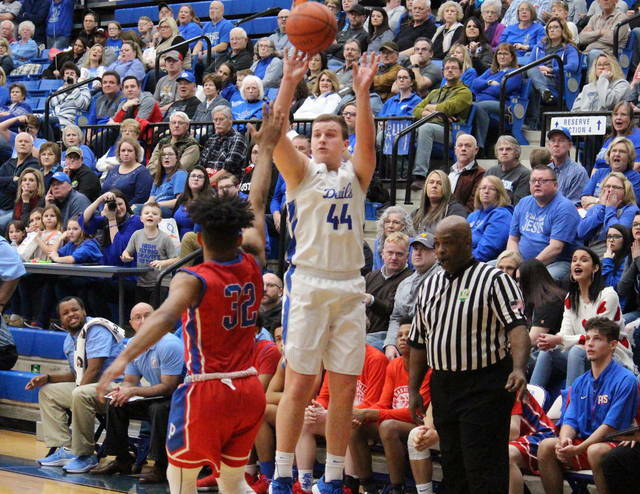 For the game, Gallia Academy shot 20-of-44 (45.5 percent) from the field, including 4-of-14 (28.6 percent) from three-point range, while Portsmouth was 13-of-38 (34.2 percent) from the field, including 4-of-13 (30.8 percent) from deep. Both teams attempted 14 free throws, GAHS making 11 for 78.6 percent, and PHS making seven for 50 percent. The hosts won the rebounding battle by a 24-to-21 clip, with both teams grabbing seven offensive boards. The Blue Devils combined for 14 assists and 10 steals, while the Trojans ended with five assists, five steals and three blocked shots. 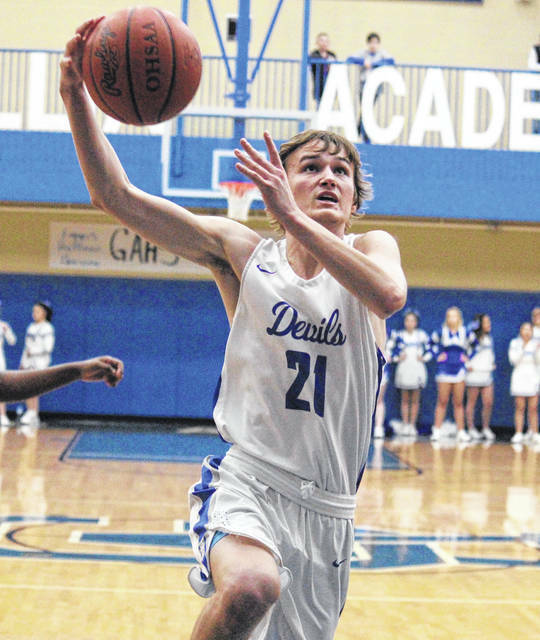 GAHS senior Cory Call — who recorded a game-high four steals to pace the Blue Devil defense — led all scorers with 19 points, combining eight two-pointers and one triple. Caleb Henry was next for the hosts with 14 points, followed by Bailey Walker with nine points on a team-best three trifectas. Damon Cremeans scored six points for the hosts, while Cole Davis, Justin McClelland and Ben Cox tallied two points apiece, with McClelland dishing out a game-high six assists. Blaine Carter rounded out the Blue Devil scoring with one point, to go with a team-best five rebounds. Matthew Fraulini led Portsmouth with 15 points, including nine from long range. Daniel Lattimore and MyQuel McKinley had six points apiece in the setback, Richie Bowman added five, while Miles Shipp had four points and team-highs of eight rebounds and two assists. Amare Johnson capped off the guests’ total with one marker. Portsmouth’s defense was led by Lattimore with two steals and a block, and Shipp with two blocks and a steal. Prior to the contest, GAHS honored its seven seniors, Justin McClelland, Cory Call, Bailey Walker, Cole Davis, Blaine Carter, Brendan Carter and Caleb Henry, playing in their final home game as Blue Devils. Coach Harrison commended the Blue Devil seniors for their part in restoring success to the Gallia Academy program. 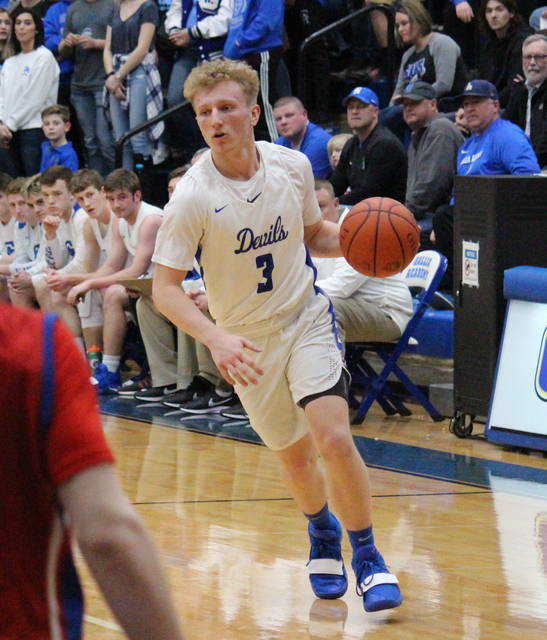 After a non-conference trip to Point Pleasant on Saturday, the Blue Devils will get back to work in the OVC when they visit to South Point on Tuesday.